Radicular cyst is a slow-growing fluid-filled epithelial sac at the apex of a tooth with a nonvital pulp or defective root canal filling. It presupposes physical, chemical or bacterial injury resulting in death of pulp followed by stimulation of epithelial cell rests of Malaseez, which are present normally in periodontal ligament. Periapical Cyst: These are the radicular cysts which are present at root apex. Lateral Radicular Cyst: These are the radicular cysts which are present at the opening of lateral accessory root canals of offending tooth. 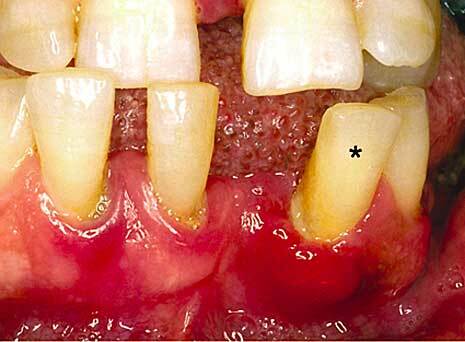 Residual Cyst: These are the radicular cysts which remains even after extraction of offending tooth. The greater incidence is between 20 and 60 years. The mechanism of stimulation of epithelial cells to proliferate is not clear. It is presumed that the biochemical alterations caused by a chronic inflammatory process, creating a rich ambient of cytokines, stimulate the residual of malassez to the proliferation. A study published in Sage Journal demonstrates that Interleukin- I(c (IL- I cx) and matrix metalloproteinase-9 (MMP-9) are thought to be involved in odontogenic cyst expansion. In this study, they investigated the effects of IL- I t on the secretion and activation of MMP-9 in odontogenic jaw cysts. It is a process by which cavity becomes lined by proliferating epithelium. Most widely accepted theory suggests that initial reaction leading to cyst formation is a proliferation of epithelial rests in periapical area involved by granuloma. As this proliferation continues with the epithelial mass increasing in size by division of the cells on periphery corresponding to basal layer of surface epithelium. The cells of central portion of mass become separated further and further from nutrition in comparison with basal layer due to which they fail to obtain sufficient nutrition, they eventually degenerate, become necrotic and liquify. This creates an epithelium lined cavity filled with fluid. Experimental work provided evidence that osmosis makes contribution to increase in size of cyst. Fluids of Radicular cysts have Gamma Globulin level high by almost more than half to patient’s own serum. Plasma protein exudate and Hyaluronic acid as well as products of cell breakdown contribute to high osmotic pressure of cystic fluid on cyst walls which causes resorption of bone & enlargement of cyst,producing bone resorption factor, as PGE2; Cyclooxygenase (COX), known as prostaglandin endoperoxide synthase, is a key enzyme in prostaglandin (PG) biosynthesis. Currently there are two known human isoforms of COX, designated as COX-1 and -2 (Hla et al.1999).Many of the inflammatory and inducible effects of COX are mediated through COX-2, whilst many of the constitutive or house keeping effects of this enzyme are mediated through COX-1 (Smith 1989). This is indicated by the tissue specific expression of each isoform; COX-1 is constitutively expressed in nearly all human tissues, whereas COX-2 is at low or undetectable levels in healthy tissues (Dubois et al.1998) and is upregulated in inflamed tissues (Morton & Dongari-Bagtzoglou 2001). a) Enucleation: The affected tooth is extracted or preserved by root canal treatment with apicocetomy. A mucoperiosteal flap over cyst is raised & a window is opened in the bone to give adequate access. The cyst is carefully seperated from its bony wall. The entire cyst is removed intact. the edges of bony cavity are smoothened off, free bleeding is controlled and cavity is irrigated to remove debris. Mucoperiosteal flap is replaced back and sutured in place. b) Marsupialisation: The cyst is opened essentially as for enucleation but the epithelial lining is sutured to mucous membrane at margins of opening. The aim is to produce a self clensing cavity, which becomes an invagination of oral tissues. The cavity is initially packed with ribbon gauze & after margins are healed a plug or extension of denture is made to close the openings. The cavity usually closes by regrowth of surrounding tissues and restoration of normal contour of that part. However, there are always chances of closing the orifice & reformation of cyst. The main application is for temporary decompression of exceptionally large cyst where fracture of jaw is a risk factor. When enough new bone is formed, cyst can be enucleated.